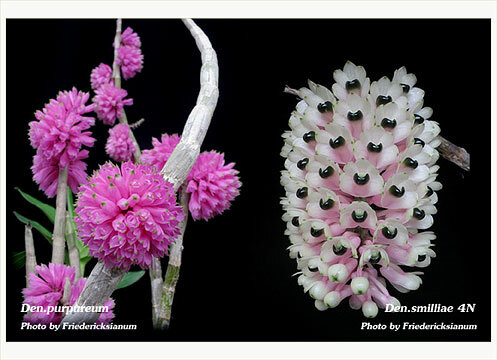 An amazing new hybrid mating two of the most charming densely flowered Dendrobium species! Favoring the growth habit of Den. purpureum and the flowering habit of Den. smilliae, it produces its many flowered raceme near the apex of its deciduous canes. 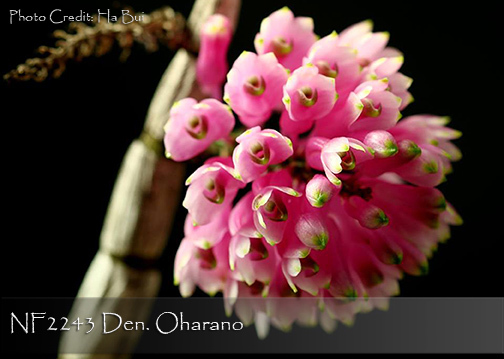 This hybrid has no particular flowering season and will re-flower from previously bloomed canes in addition to flowering from newly matured canes. Carrying great heat tolerance, a slight winter reduction from water and fertilizer should be provided until the appearance of new growth in the spring. These plants are 3-4 years old bearing 3-5 canes, just ready to burst into bloom this fall and next spring. Highly Recommended! Note: Limited , tall Husky Plant over 26" .